I’ve written before on the wonderful driving habits of the newly motorised Chinese. While they don’t exactly have the concept of Shared Space*, they do have the related concept of might makes right of way, and it doesn’t matter to a Chinese car owner whether a bit of land is technically a bike track or a footway. Not surprisingly, there is a massive death rate on the roads there, to the extent that the driving test prepares you to manage massive traumatic injuries. 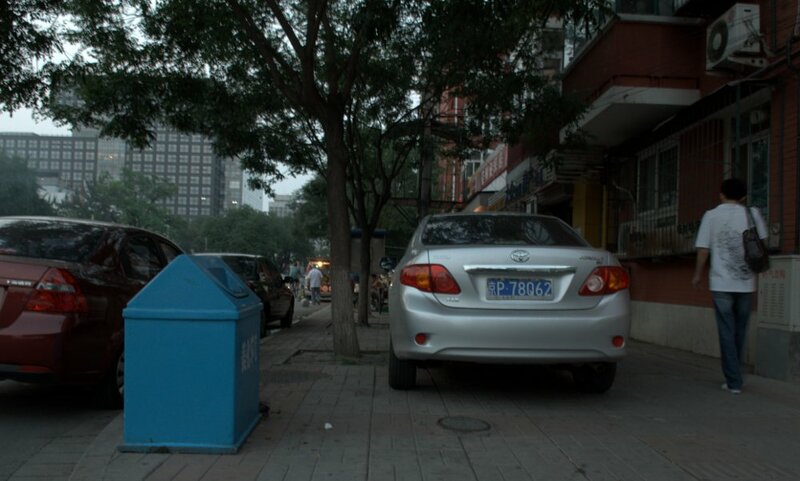 In some of the backstreets of the Hutong neighbourhoods, the motor car has been banned because its presence overwhelms all other activities in the narrow spaces. This picture used to be my favourite illustration of the current Chinese approach to roads, but the video above has surpassed it. * A nice introduction to Shared Space is given by David Arditti. The Ministry of Transport’s 1963 Buchanan Report on the future of traffic in towns may have thought of jetpacks and hoverboards as a potentially real future for individual private travel, but it didn’t ignore public transport entirely. Obviously, in 1963 the railways were obsolete, but the report suggested there was some scope for “multi-passenger units”, particularly ultra high speed devices on long journeys between dense population centres. 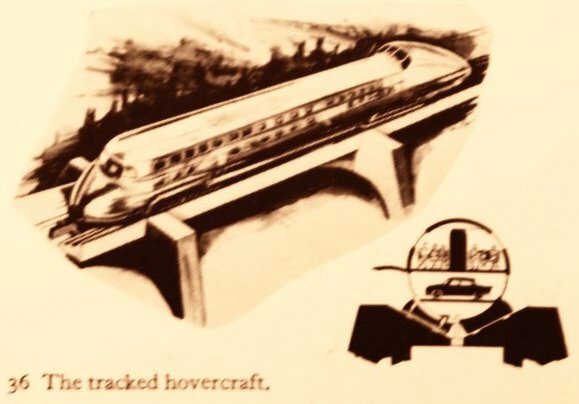 The most delightful is this fabulous art-deco “tracked hovercraft”. Happy 1960s families, where the women all wear skirts and sit cross-legged and the men all read big important newspapers, drive their car into the bottom deck and sit in airline-style comfort on the upper deck. It’s not clear whether “tracks” in this solution refer to rail tracks or to caterpillar tracks — the diagram appears to show elements that could be interpreted as either. Perhaps it has both, for ultimate flexibility. It is possible, of course, if serious technological studies were undertaken, that a whole range of new ideas for moving people and goods in cities would be produced. It is indeed to be hoped that we are not at the end of our ingenuity in the matter. The bus, for example, for all its convenience, does not appear to be the last word in comfort. The travelator seems to offer much scope for development. Continuously operating chair-lifts might be used in a highly attractive way between points of pedestrian concentration to augment existing means of travel. Conveyor belts, pneumatic tubes, and pipelines might well be developed for the conveyance of goods, perhaps even justifying rearrangement of commercial processes to facilitate their use. Monorails and moving pavements were the future of public transport in the 1960s — at least while we were waiting for our moon bases and space elevators. Once upon a time, highly educated and expensive civil engineers were required to invent absurd transport solutions. Now all you need is an idiot who knows how to open photoshop. For those unfamiliar with the city, Shenzhen neighbours Hong Kong; it was a fishing village right into the late 1970s when China created a “special economic zone” encouraging market capitalism here. The city now has a population estimated to be 14 million squeezed into the limits of the SEZ, and is one of the fastest growing cities in the world. It’s an entirely new city, conceived late in the motorcar era, and full of the wide boulevards you would expect in modern car dependent Chinese cities. Shenzhen is the future. At least, it must feel that way to the people who live there. The Chinese are in the middle of great change: social progress, economic development, and technological revolution. This is their 1960s, and more. They’re putting men into space to prepare the way for the space elevators. They’re also struggling with the sort of problems that European cities were struggling with the the 1960s. In the picture above you can see how this little city street is too narrow to accommodate conventional buses. Conventional buses keep stopping and starting, and this causes congestion as Important People in cars have to slow down and move over into one of the other four lanes available to them. 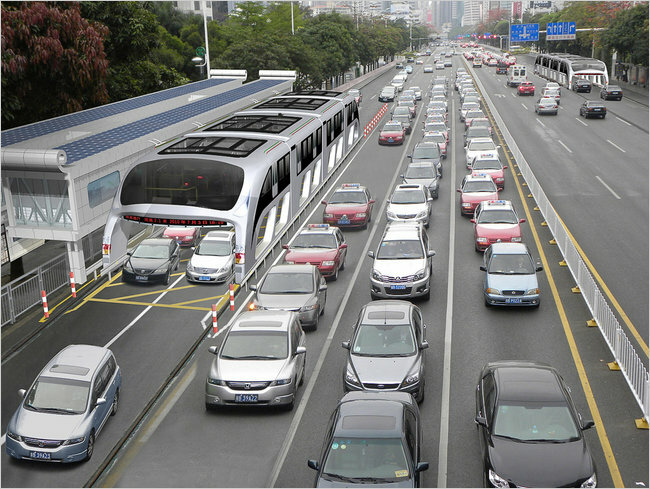 Therefore there is a need to invent the straddling bus, which will not impair Important Motor Traffic — those SUVs and executive saloon cars can happily drive under it (albeit, only having been considerably shrunk in photoshop). I can actually spot at least three things that are wrong. Can you? Answers in the comments. 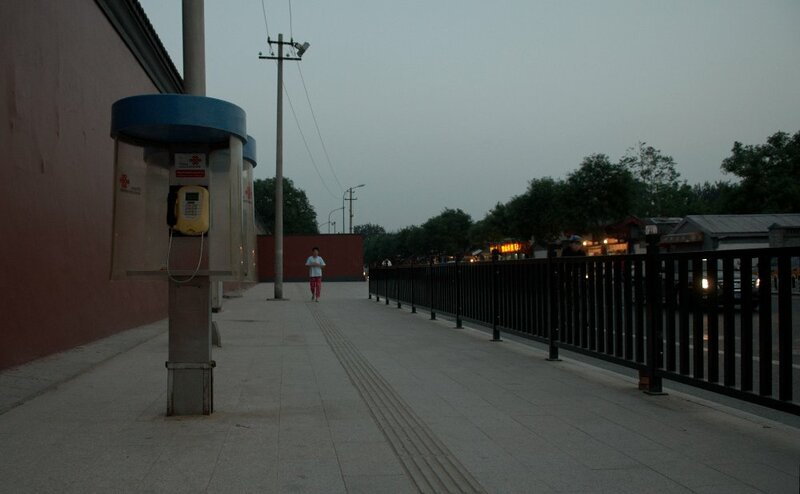 See more great pedestrian facilities at China Hush. 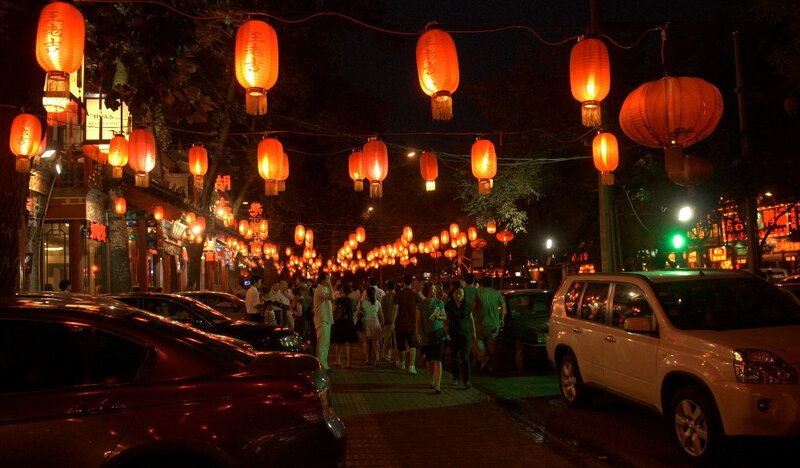 Beijing has some lovely wide avenues. It’s not like London, where the streets are only wide enough for cars, and are too narrow for bicycles. The boulevards that cross the grid-patterned city at half-km intervals are not only wide enough for three or four lanes of traffic each way and a generous pavement for the pedestrians, they can also comfortably accommodate spacious segregated cycle paths between the two. Indeed, the pavements and cycle paths are so wastefully over-endowed that each can just about fit three motor-vehicles across their width: one park ed on each side, and one carefully crawling between them looking for a space. 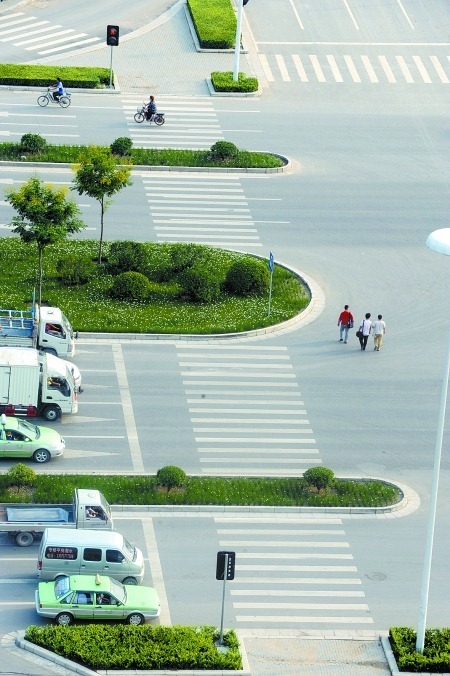 The Chinese have brilliantly invented a road design that gets eight parking places per car’s length of road, and the Motorist doesn’t even have to get in anybody’s way: all eight lanes of through traffic can remain clear and free flowing. The best that London can manage is four parallel parking places — and the pavements are never wide enough to accommodate more than one of those each. Once again, China demonstrate why they are the future and we are the past. 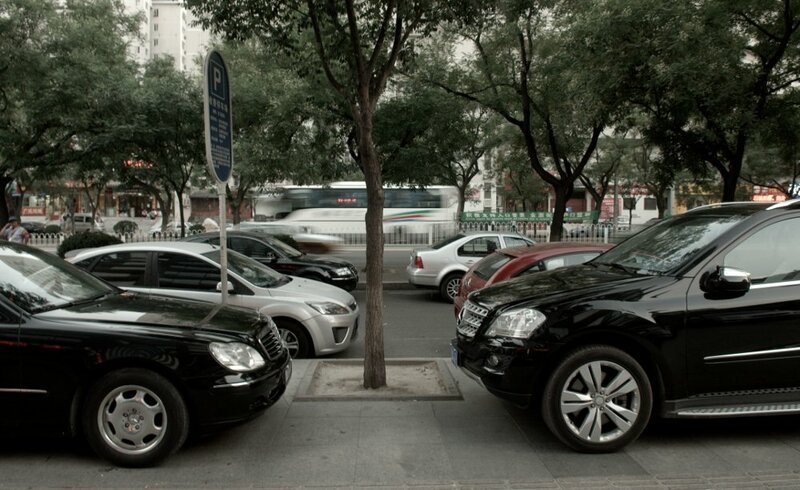 Beijing has five million cars already. Just over twice as many as London, for a population three times the size. The number of cars on the streets grows by 10% per year. With each new morning, there are 1,500 more cars idling in the jams on the five ring-roads; 1,500 more freshly graduated drivers, free to roam, safe with the knowledge of what to do with the exposed intestines of the pedestrians and cyclists they drive over. Every new day 1,500 more cars than yesterday need to be parked somewhere convenient in the central business districts of Beijing. They compete for 940,000 official parking spaces. I like to think that these railings were made from the melted-down iron of London's own recently removed pedestrian cages. 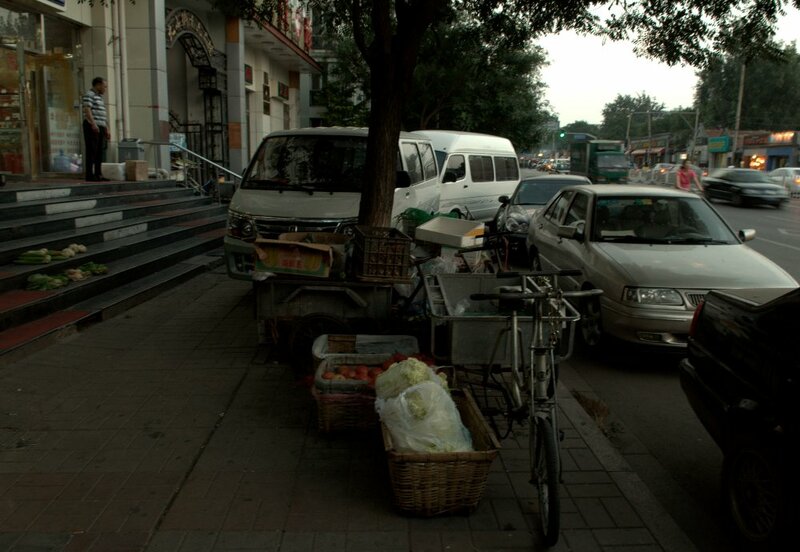 The problem with walking around Beijing, though, is that for some reason people kept thinking that their bicycles (and tricycles) belonged on the pavement. Even worse, on sections where the pavements are narrower and are therefore only wide enough to accommodate a single car parked perpendicular to the road, pedestrians must of course walk on the cycle path, being careful not to scratch the paintwork of any car that is driving down it in search of that elusive available space. And yet, rather than recognising that the cycle path simply isn’t wide enough for bicycles, cyclists continue to try to push their way down them, ringing their bells intimidatingly at pedestrians and Motorists. These are the sorts of selfish and anti-social behaviours that the city’s authorities need to crack down on if they are to complete their transition to a pleasant, modern, developed city. Look at this selfishly parked tricycle. The most memorable question is the one about intestines. Specifically, it’s a multiple-choice question about what to do if you come across a traffic accident victim with an open abdominal wound from which the small intestine is protruding. The choices are a) put it back, b) no treatment, or c) not put it back but cover with a bowl or jar, and bind the bowl or jar with a cloth belt. To be sure, the official booklet of rules and regulations does have a chapter titled “Driving With Civility and Professional Ethics.” One question asks if drivers should a) deliberately underestimate each other, b) compete for road supremacy or c) learn and help each other, adopt one’s strong point while overcoming one’s weak point and keep safely driving. No, I don’t know what the last homily means either. The answers can be found in the article, alongside many other curious observations. How many people die on China’s roads, and why? Lots of sources say that a quarter of a million people die in RTAs in China every year, attributing it vaguely to the World Health Organisation. WolframAlpha also stated this number, attributing it only to “2002”. So, eight years ago — when the boom in China’s car dependency was only just beginning — there were 250,000 road deaths in China, accounting for 19.2 deaths per 100k. By comparison, the UK had just 3,864 road deaths — but, due to the difference in demographics, had a statistically indistinguishable 19.1 deaths per 100k. The interesting thing to note, though, is that while China had more than an order of magnitude more people than the UK, it had only 3.5 million cars, compared to the UK’s 28.5 million cars. * So while in the UK there were about 135 road deaths per million cars; in China there were a whopping 71,400. In 2002 there were five hundred times as many fatalities per-car in China compared to the UK. As Melinda Liu puts it, China’s 1.3 billion people own 2 percent of the world’s vehicles but account for 15 percent of global traffic deaths. There are many hypotheses for why China’s roads are so anarchic and dangerous. In reality, most of them are probably parts of the explanation, to varying extents. One obvious reason is that most drivers in Beijing are new to the whole driving thing. This is a city where car ownership is growing at 10% per year and half of all drivers received their license within the past 5 years. Everyone is a new driver, and there’s nobody with experience to set an example. Amateur sociologists propose all sorts of other reasons, focusing on the context of China as a non-democratic nation — why in an authoritarian regime is there this pocket of anarchy? 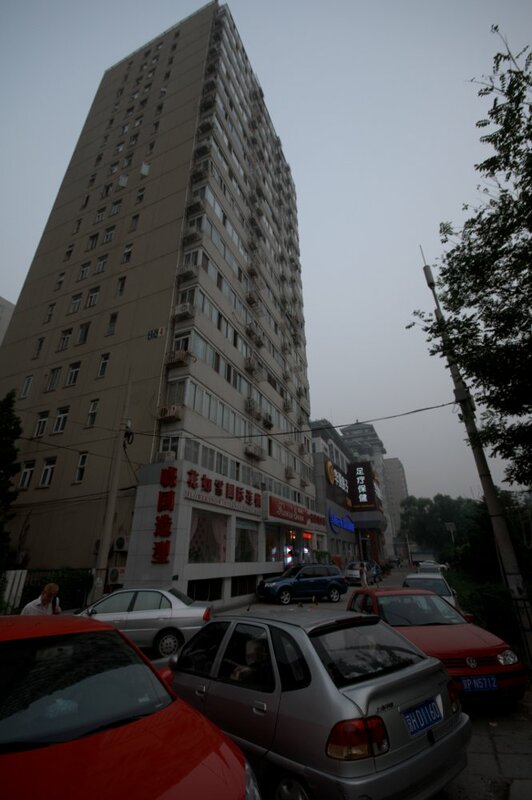 In Tom Vanderbilt‘s Traffic, Beijing-based journalist Jonathan Landreth proposes that a car in traffic is the only place where the established societal hierarchy of the city breaks down, to be replaced with another where the little guy can achieve equality with the company director or city official: everybody is trying to assert themselves and create for themselves an elevated status. They’re overcompensating for something. Drivers overcompensating? It all seems a bit implausible. 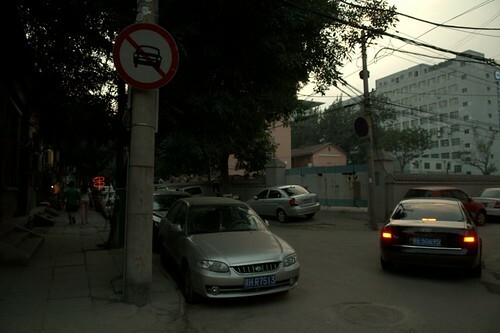 As a matter of fact, China has very detailed traffic rules that are covered in computerized tests for license applicants. For example, motorists pay a fine of 200 yuan ($29.3) and lose two points if they tailgate or take a phone call while driving. But there is less of an incentive for obeying the law if people realize that those in power are not following the law. When stuck in a traffic jam, who doesn’t want to go follow an official who veers off to drive on the road shoulder or a bike lane? The main reason, though, is the most obvious one of all. When the law is not enforced, people break it. * All figures from Professor Google — these were thrown together in a lunch break, they are not serious scholarship or investigative journalism.